The package management system used on Debian and the "downstream" distros based on it such as Ubuntu and Mint. See also SSH for more specific uses. Screen is an essential utility to use during an SSH session over dodgy connections that can drop or when doing something mission-critical. Just use the screen command without any parameters and another shell session will start (if you exit you'll be back in the original shell session again). This new shell session will remain active even if the connection drops. To get back into the session again later, use screen -R. There are many other options for using multiple screen sessions and multiple windows onto a single session etc, see this screen cheatsheet for more details. Note: One annoying issue with screen is that the normal scroll-back doesn't work, but you can user CTRL+A then ESC to activate "copy mode" which then allows you to scroll back using the cursor keys or page up/down. To exit "copy mode" use ESC again. Note using port forwarding for commonly accessed sites you can define non standard ports in your .ssh/config so you never need to explicitly state them above. This ability is included natively in Linux and used to be very useful for splitting large backups up so they could fit onto small media such as floppy disks. But there's one time when it's very useful nowadays too which is when a large file transfer gets interupted and there's no option for continuation such as when using SCP. When this happens, go onto the target machine, check how many bytes were transferred of the target file and rename it to "xaa". Then on the local machine, do the following command to split the source file into two parts, the first being of the size of the number of bytes that have already been transferred (in this example 1234567 bytes). The resulting files are called "xaa" and "xab", and the latter is the containing the remaining content that needs to be transferred to the target server. Once you've transferred it across, you can then join the two files (remember you renamed the first part to "xaa" so there's no need to transfer that) together using cat as follows, and then remove all the xa* files from noth source and target servers. SSH allows you to forward ports on one machine to another using the SSH pipes. Now you can access the database locally on port 3333. You can now ssh into the local machine from within the remote server on port 2222 instead. Note that by default the forwarded port is only accessible locally, but you can change this behaviour with the GatewayPorts SSH option. Lets say you're doing some maintenance on your site and you'd like to redirect all the requests on port 80 to another web-server (SERVER) on port 8080. You could set up your temporary web-server on 8080 on a remote server and then after you've stopped the local web-server, forward all requests for port 80 to 8080 on the remote machine with a local port-forward. By using the GatewayPorts option, the forwarded port 80 is available externally. Now the host at 1.2.3.4 is able to SSH into our firewalled machine on port 2222 of USER@SERVER. See also this post regarding security for port-forwarding accounts. Sometimes you need to browse using an IP address that's in another location, for example if the content you want to access is only available to local users or if you're buying something and the prices are based on the buyers location. 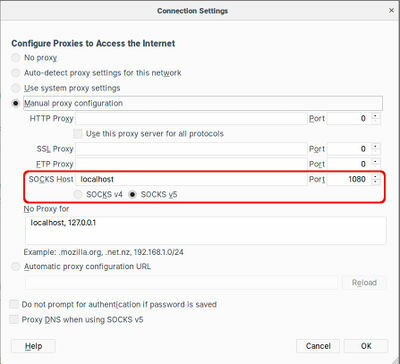 If you have access to a server in the required location, or someone you know in that location is willing to temporarily set up an SSH server that you can access, the you can use the following syntax to set up a local port that your browser can use as a proxy server. The N option means to use this SSH session only for tunnelling, not to open up a shell session as well. Next you need to configure your browser to connect via this local port. Chromium allows you to specify the proxy details as a command-line option, so there's no need to change the network configuration and then change it back afterwards. Simply open a shell window and use the following syntax (make sure there are no other Chromium windows open when you do this). In Firefox you need to change the Network Proxy setting in Preferences/General. The changes take effect instantly without needing a restart or anything, but you'll need to remember to change the setting back after the SSH connection is closed. To check what filesystem a device has on it use file, e.g. Here's an example looking for a phrase within a specific file type recursively through a directory structure, and printing the file names and line numbers of the resulting matches. There are other tips at stackoverflow.com. Windows editors often add a BOM character to the beginning of UTF-8 encoded text files, these cause a lot of trouble for many types of scripts such as PHP and the problem can be very hard to track down. This short shell one-liner I found here searches the current directory recursively showing what files have a BOM, you can then use a decent editor like Geany to remove them. mmv is a mass move/copy/renaming tool that uses standard wildcards to perform its functions. According to the manual the “;” wildcard is useful for matching files at any depth in the directory tree (ie it will go below the current directory, recursively). This is very handy if you need to know if two directory structures are the same or not including file content. It uses the diff command with the r switch to work recursively and the x switch to allow skipping of the .svn directories. Remember that this is a very low-level operation and so if you're cloning a live partition you may end up with partially written files or other corruption issues on the destination. Stop as many services as you can first, do an fsck afterwards and manually copy any directories that had issues. The sdb and sdc devices look identical with commands such as lsblk or fdisk -l, but one of the is a RAID pair and the other just a normal drive. It may sometimes be useful to change the UUIDs of partitions such as when they've been cloned with a low-level method like dd. Note: the disk identifier should also be changed which you can do with fdisk from the expert menu. Thanks to FrankerZ for this! The first command outputs a code which you put into the second command. The first line shows how to reduce and image to 25% and quality to 50% adding "_resized" to the results filename. The second command uses Perl to apply this same command to all JPG's in the current directory. Note: Many operating systems including Ubuntu are now using the libav fork of ffmpeg now which means you should use the avconv command instead. Here's a more complicated example which converts mp4 video into mp3 audio at a lower quality with only one channel at 11KHz and 32kbps. Use the following commands to extract a small (5 seconds in this example) snippet out of a video (the -ar switch is only needed for outputting to flv I think). ffmpeg -i "foo.avi" -ss 00:10:10 -t 5 -ar 22050 "foo.flv"
Then use the tool to download the video, e.g. This is very useful for debugging interactions with services, for example the following command shows traffic going between a local elasticsearch service and a local client application. Servers can be assigned many IPv6 addresses, but which one should you assign to AAAA records pointing at the server? This command shows which address is being used to make outgoing connections which would be the best one to use for incoming connections as well. The address used to test the outgoing connection here is google's public DNS server. This will download an entire site, if the site is already downloaded, then only newer files are transferred. Port forwarding allows a remote client to gain access to a network so an intranet can be accessed. Then point your webbrowsers proxy server to appserver:[PORT] and access the intranet etc. To subvert a firewalled environment where outgoing ssh is allowed. Further it's possible to get ssh through a web proxy using corkscrew. You can get daily and monthly traffic statistics that are updated every five minutes by installing the vnstat package. This is very useful if your ISP enforces a traffic limit. You can get reports on individual network interfaces. This page was last edited on 5 April 2019, at 09:05.